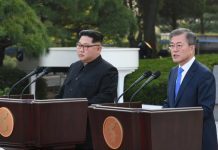 As South Korea prepares for next month’s summit between President Moon Jae In and North Korean leader Kim Jong Un, analysts and commentators are widely speculating that Kim’s top priority will be to attain recognition for his country as a legitimate member of the international community. Observers have noted that since Kim took power, he has given a number of signals suggesting a desire to conform to more standard international etiquette when dealing with other countries. One example of this came during the recent visit to Pyongyang by a team of South Korean special envoys, where Kim Jong Un personally hosted a dinner banquet for his South Korean guests. The attendance of Kim Jong Un’s wife Ri Sol Ju was considered an attempt to follow international diplomatic norms for such dinners, and was a glaring departure from the habits of his father Kim Jong Il, whose wife was absent from previous inter-Korean summit banquets. Another major difference is that while Kim Jong Il hosted his South Korean guests at the Paekhwawon State Guest House in Pyongyang, Kim Jong Un went a step further by inviting the special delegation into his office in the main building of the Korean Workers’ Party – an unprecedented gesture for North Korea, but in keeping with norms of international diplomacy. 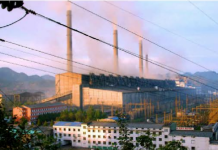 But evidence of the North’s attempts to change its image also date back to the early years of Kim Jong Un’s rule. The familiar image of a country’s leader and spouse descending the stairs of a private jet on a tarmac is one associated with many nations around the globe, but was not an image that could be seen in North Korea – until Kim Jong Un became the first North Korean leader to feature in one. North Korean media at the time aired images and video of a large ceremony greeting the arrival of the leader’s jet, with Kim and Ri exiting a private plane and waving to the crowd on their way to attend a major aviation demonstration in May 2014. Kim Jong Un’s use of a private jet was also a departure from his father’s paranoid insistence on only traveling by train. The inspection of the staircase by an army guard prior to Kim exiting the plane was also shown in the media. 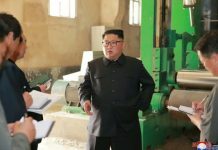 “The scene was meant to display Kim’s solid place at the top of the country’s power structure while at the same time show that North Korea was a ‘normal nation,'” one North Korea expert told Daily NK on condition of anonymity. Kim Jong Un also attended the “9th National Meeting of Artists” days later on May 16, 2014, which opened with the national anthem before a performance by the Moranbong Band. The audience, including Kim Jong Un and wife Ri, all stood and turned towards a large North Korean flag on the stage for the duration of the anthem. This was the first time that the anthem – usually saved for international sporting contests – was played during such an event in North Korea, where it was previously standard to play “Song of the General Kim Il Sung,” “Song of the General Kim Jong Il,” or another political song personally praising the leader of the country. The change was again seen by some as an attempt to mimic the decorum followed by other countries.